On Veterans Day, Americans come together to say thank you to those who have served our country. We want to take this opportunity to extend our heartfelt thanks, and make it easier for riders to do the same. Nearly 70,000 service members, veterans and military spouses have signed up to drive as part of the UberMILITARY community. 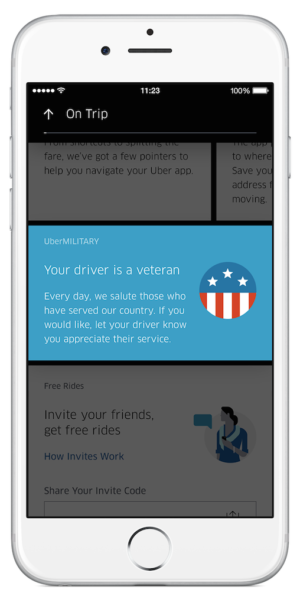 Starting today, veterans and military families who drive with Uber can share their military affiliation with riders directly through the new Uber app. 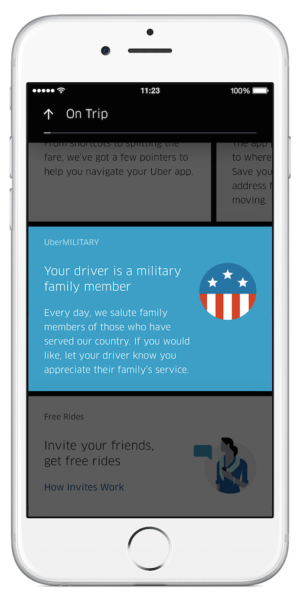 When a rider is matched with a member of the UberMILITARY community, a card will appear in their app letting them know their driver is a veteran or military family member. This is our way of showing our thanks to those who have served, and to bring our community closer together. But we know we can always do more to honor the service of those who have worn the uniform and their families. That’s why we’ve partnered with the Fisher House Foundation to provide up to 6,000 families staying at Fisher House locations in Los Angeles, Houston, St. Louis, Miami and Washington, DC with an Uber gift card worth $25 that they can use to access reliable rides at the push of a button over the next year. The Fisher House is an important nonprofit that builds homes near DoD and VA hospitals so military families have a place to stay, free of charge, while their loved one is recuperating in the hospital. Once these homes are built, Fisher House donates the home to the DoD or the VA. In 2015, they served more than 27,000 families with a daily capacity of 935 rooms. America’s veterans and military families have done so much on behalf of our Nation. This Veterans Day, we’re inviting members of the Uber community to join us in recognizing their service and those who have stood beside them every step of the way.